Sunday, Nov. 10, 12:57 a.m. EST. 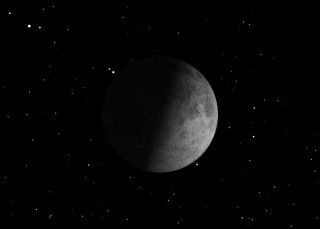 The First Quarter Moon rises around 2:00 p.m. and sets around 12:40 a.m. It dominates the evening sky. Alexandra Hall, senior director of the Google Lunar XPRIZE, contributed this article to SPACE.com's Expert Voices: Op-Ed & Insights. Back in 2007, building upon the successes of the Ansari XPRIZE for suborbital spaceflight and the Northrop Grumman Lunar Lander Challenge, XPRIZE and Google launched the $30 million Google Lunar XPRIZE, the largest incentivized competition to date. The concept was easy to explain: land on the moon, move 500 meters and send back video, images and data. The prize requirements were conceived to demonstrate the minimum useful capability a spacecraft would need for future uses in space exploration and scientific research. Thirty teams signed up for this audacious challenge by the close of registration in 2010 — three times as many as the initial concept study had suggested. Going back to the moon had clearly struck a chord! This week, XPRIZE and Google announced a series of Milestone Prizes available to competing teams. The reason for introducing these prizes deserves a little background. Over the past decade, XPRIZE has successfully launched and awarded a number of competitions, learning a great deal about what makes for optimum prize design. We've learned that success is more likely if we continue to keep our eye on the entire ecosystem surrounding a prize, and when we address any significant challenges to that ecosystem that may arise. Given the large investment needed to send a robot to the moon, two elements of the Google Lunar XPRIZE ecosystem are critical: potential customers for the technology developed by teams, and investors to help create the businesses to leverage those markets. In both of these areas, much has changed since the Google Lunar XPRIZE was launched. The global economic downturn has reduced an already small pool of investors who are willing to take risks on pioneering new markets. This same downturn has also stagnated or reduced the budgets that governments — usually an early future customer — are willing to spend in space exploration (of note, NASA has changed its focus from going back to the moon to exploring asteroids ). Two years ago, XPRIZE began a dialogue with teams to better understand the challenges that they were facing and to determine what steps we might take to better nurture and support this prize ecosystem. As a result, we determined that we needed to find a way to recognize and support the teams that were making substantial technical progress toward the requirements of the competition. Hence the newly announced Milestone Prizes. Within the next year, there are certain developmental milestones for flight-ready hardware that teams must pass in order to meet the mission requirements and be ready to launch by the deadline of Dec. 31, 2015. Recognizing and rewarding these milestones will not only help the competing teams by allowing them to access financing at a critical point in their mission timeline, but it will also raise public excitement and support for the teams. The Milestone Prizes are for demonstrating (via actual testing and analysis) robust hardware and software to combat key technical risks in the areas of imaging, mobility and lander systems — all three being necessary to achieve a successful Google Lunar XPRIZE mission. Teams will submit their proposals to our judging panel, which will select up to four proposals to monitor in each of the imaging and mobility subsystems, and three proposals for the lander system, for a total of 11 proposals. A team may have proposals selected in more than one area. Provided the team successfully accomplishes the tasks described in their selected proposal in the timeframe agreed, they will win a Milestone Prize. The amounts are $250,000 for the Imaging Subsystem Milestone Prize (for up to 4 teams), $500,000 for the Mobility Subsystem Milestone Prize (for up to 4 teams), and $1 million for the Lander System Milestone Prize (for up to 3 teams), for a total purse of $6 million. The Milestone Prizes can be won through the end of September 2014. With the introduction of these prizes, 2014 is looking to be a very exciting year for the Google Lunar XPRIZE with critical hardware and software testing and many great opportunities to recognize our teams and their significant achievements. While we cannot fix the global economic downturn, we can at least highlight the ways in which our teams are bringing us closer to a new era of private lunar exploration, taking us back to the moon, for good.